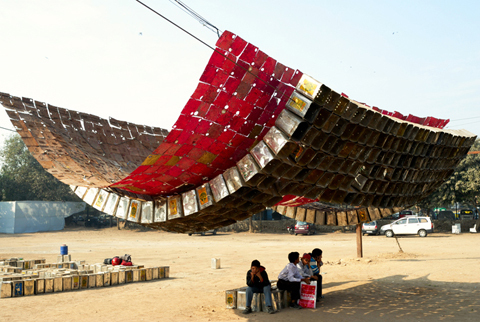 A Jugaad Canopy, New Delhi, India. Photo: Sundeep Bali. 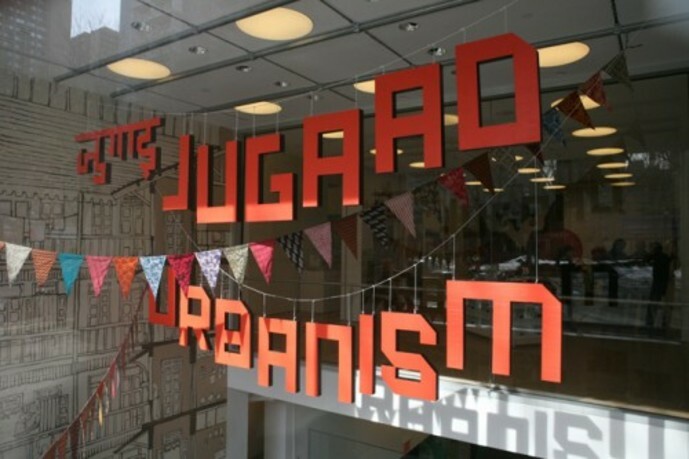 Set in the radically uneven urban landscapes of Delhi, Mumbai, Ahmedabad and Pune, India, Jugaad Urbanism explores how the energy of citizens “making-do” is translated by architects, urban planners, and governmental and nongovernmental entities into efficient and inventive strategies for sustainable urban growth. From energy generating spinning wheels to the extensive skywalks of Mumbai, the exhibition highlights how "jugaad" interventions (a term in Hindi used to describe an innovative, resourceful approach) are challenging traditional spatial hierarchies and mechanistic planning principles. The work of Indian artists, including Raqs Media Collective, is included in the exhibition and offers insights into the complex and oft cited “messy” urbanism of India. The exhibition is on view from February 10 to May 21, 2011. The Center for Architecture is a destination for all interested in the built environment. It is home to the American Institute of Architects New York Chapter and the Center for Architecture Foundation, vibrant nonprofit organizations that provide resources to both the public and building industry professionals. Through exhibitions, programs, and special events, the Center aims to improve the quality and sustainability of the built environment, foster exchange between the design, construction, and real estate communities, and encourage collaborations across the city and globe. The Center also celebrates New York’s vibrant architecture, explores its urban fabric, shares community resources, and provides opportunities for scholarship. As the city’s leading cultural institution focusing on architecture, the Center drives positive change through the power of design.